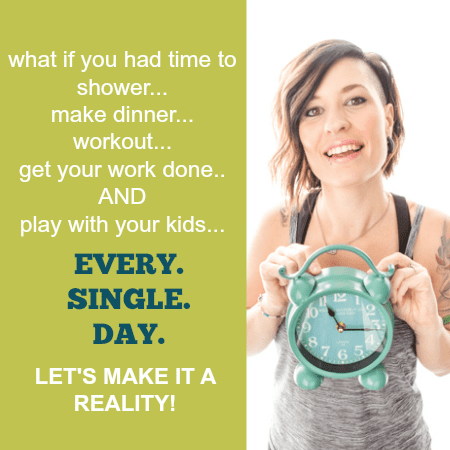 This post is sponsored by Barefoot Refresh, but as always, the content and opinions are 100% my own. The content in this post is intended for those 21 years of age or older. 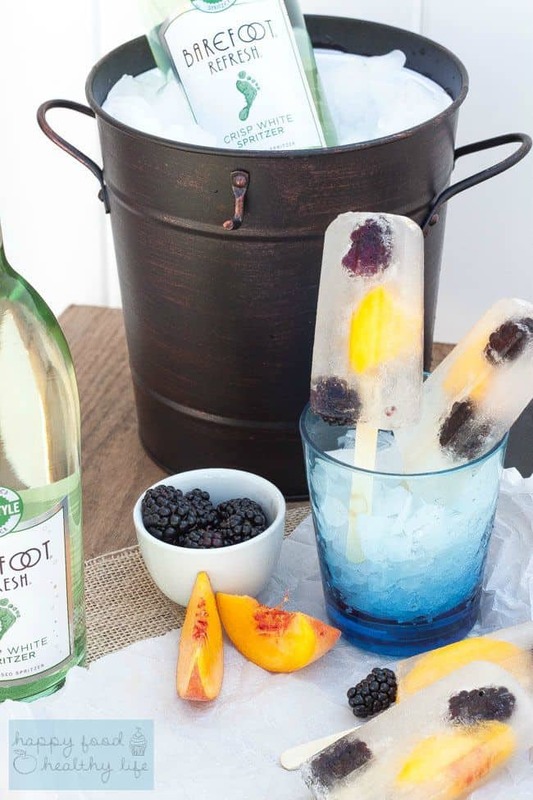 There’s no better way to enjoy a nice spritzer during the summer than in popsicle form like these Blackberry Peach Spritzer Pops. So I’m going to join in with the rest of the blogging community. We are collectively giving a big thumbs down to the end of summer. Although it may be sweltering hot still in my neck of the woods, it all started when I saw all the back-to-school pictures all over social media. That was my first hint that we were nearing the end. And then our nightly walks to the neighborhood park started to get a little chillier. Boo! And now – this is the weekend that wraps it all up. One last hurrah. A final cookout. A final swim at the pool. Now that Labor Day weekend is here, the message is loud and clear. We will all hibernate in our cozy homes. Pinterest will start with pumpkins and ghosts by next week. And within a couple weeks, it’ll look like the North Pole threw up in your Pinterest feed. Today is my birthday, and I’m calling the shots. And what I want for my birthday is one last summer weekend. One that includes reading and napping on the patio. One that includes pink painted toenails, preferably done by someone other than myself. One that includes a refreshing drink in my hand. How about a drink in one hand and a sangria-inspired spritzersicle in the other hand! 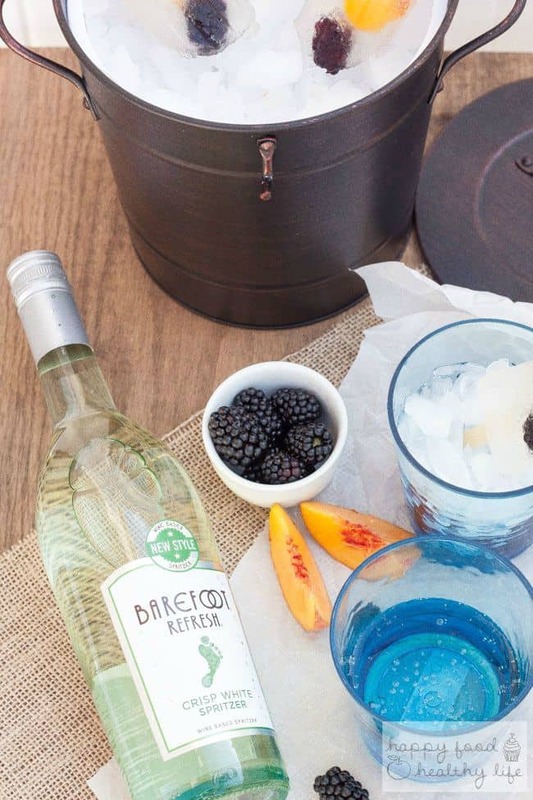 And with Barefoot Refresh’s new spritzers, I am going to have just that. Barefoot’s new spritzer collection has me madly in love. They’re light on the tongue with all their happy little bubbles dancing around. They’re refreshing and easily drinkable, especially when it’s hot out and you just need a break from the heat. I don’t know about you, but that’s a sure-fire way to cool down! 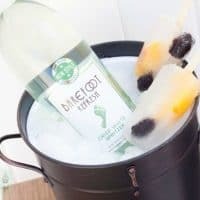 The awesome thing about these spritzers is that they can please your entire crowd on this last BBQ. Grab a Crisp White, Crisp Red, Sweet White, Summer Red, or Perfectly Pink. Or better yet, grab one of each to make sure everyone’s happy. And at only about $7 a bottle, you can totally splurge for this party! And if you’re feeling extra fancy, do what I did and enjoy the best of both worlds. 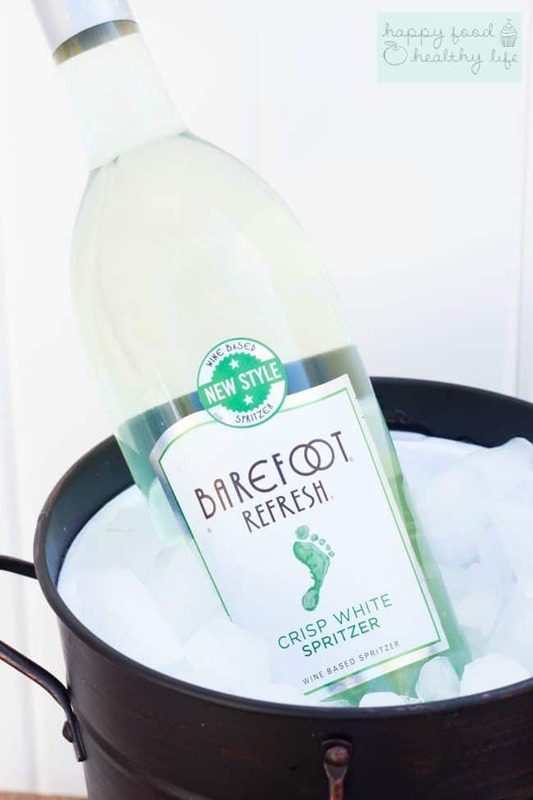 A Barefoot Refresh AND a Spritzer Pop! Totally the best choice ever! In a pitcher, combine spritzer, coconut water, and sweetener. Stir until sweetener has dissolved. Taste and adjust sweetness as needed. 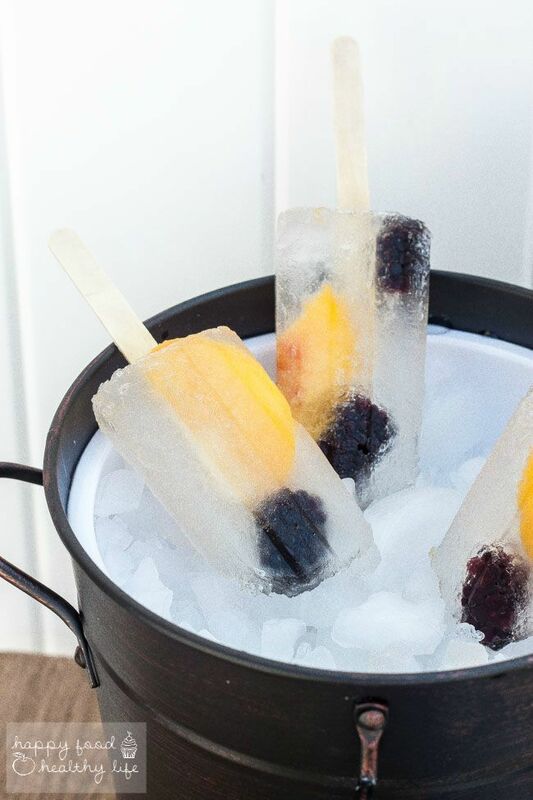 Place berries and sliced peaches into popsicle molds, I tried to choose larger berries that would stay where I placed them instead of sinking to the bottom. 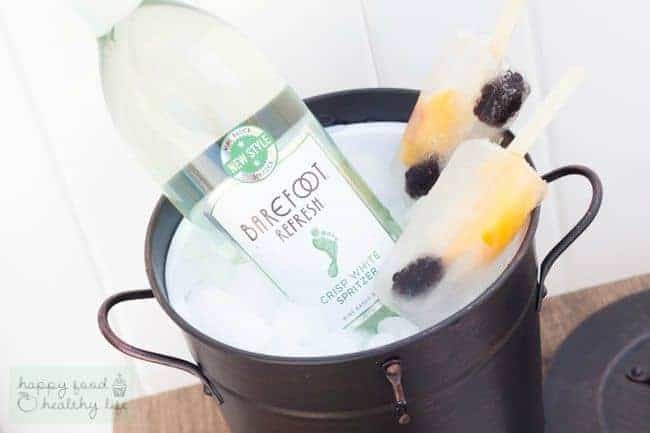 Fill the popsicle molds with spritzer mixture, top with popsicle sticks, and freeze in the freezer for at least hours. When you're ready to eat, run the mold under warm water, jiggling the sticks gently until they pull out of the mold.